Try and picture the perfect episode of Doctor Who. An episode that manages to thrill, astound, frighten and amuse in equal measure. A story that encompasses the length, breadth, depth and emotional core of time and space. A story that chills us to the bone with the most terrifying monsters that we could imagine. Most importantly, a story that reaffirms what we knew about the Doctor while opening up new windows of enlightenment and sending us off into the most wonderful, unexpected and exciting directions. 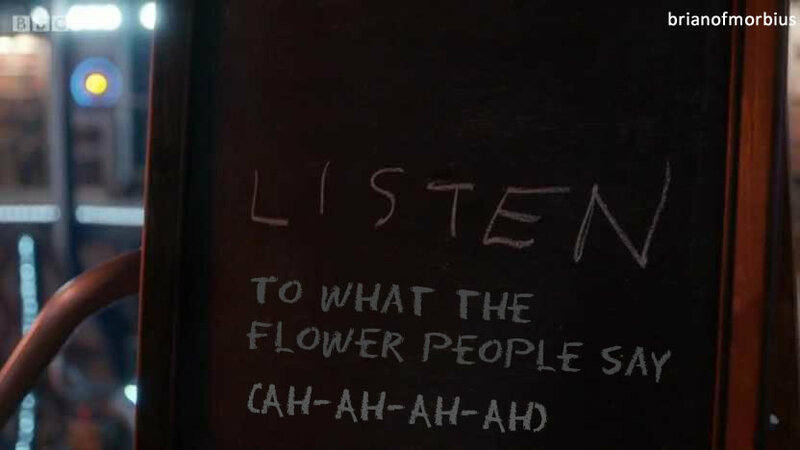 ‘Listen’ is not that episode. I feel like a broken record sometimes. The main problem is that I don’t write Doctor Who. I suspect the only way I’d be actually happy with the show is if I were the one emailing scripts to Brian Minchin every week. It’s not about keeping the quality levels up. I’m not saying the scripts are bad, necessarily – by and large, this one wasn’t. It was decently paced, occasionally funny and clever in its execution. It revisited old territory but explored it from a fresh perspective. And then it screwed with the mythology, again. It’s not that I mind explorations of the Doctor’s past. It would be churlish to criticise Moffat for trying to fill in the backstory – heaven knows Davies did enough of that when he brought back the Master. Not only were we given a reason for the Master’s madness, it transpired that most of it wasn’t actually his fault. Davies rewrote the Time Lords as despicable warmongers whom the Doctor reluctantly destroyed for the greater good, but this isn’t really such a leap from their actions in Trial of a Time Lord, or even ‘Arc of Infinity’. But what got to me about ‘Listen’ – and the episodes before it – wasn’t the revisionism. It’s the companion-centric worldview. Listen: relatable companions have always been sewed into the mantra of the show. I’m aware that a charismatic hero accompanied by a bumbling sidekick puts us into Harry Sullivan territory. You need a companion with a little pizzazz and presence and who isn’t going to spend ninety per cent of her time onscreen trying to shatter glass. Clara has pizzazz in spades. One of her best episodes is ‘Hide‘, one of the first to be shot and one in which we spent most of the time watching her just be, rather than have the universe revolve around her. It’s one of the few times the Doctor is (for the most part) more preoccupied with solving the mystery-of-the-week than he is with solving the-mystery-of-the-series. Given breathing room and the right script, Clara is wonderful to watch; very different with each Doctor she’s encountered, but that’s a strength. She’s sassy and funny and Coleman plays her extremely well. It’s therefore insulting when, once again, Clara gets to rewrite the backstory: it implies that being a twenty-seven-year-old teacher is somehow not enough. The crucial scene this week comes in the closing act, where a small boy – who turns out to be the Doctor, of course – is huddled under the covers in what looks like a set from The Village. Faced with imminent discovery from two Gallifreyans wearing Crimson Field costumes Clara’s response is to do the one thing she knows for sure will terrify the small child: she hides under the bed. The soothing monologue that follows is textbook Moffat: reassuring mawkishness from Clara, intercut with slow motion hugging and brooding shots of the Doctor, all accompanied by Murray Gold at his sweetest. You remember that scene at the end of The Two Towers where Sam monologues to Frodo, while Jackson cuts between Osgiliath and Helm’s Deep? Basically that, only the music’s rubbish. If I’m cross about this, it’s because Clara’s already had more input over the Doctor’s life than any other companion really should. 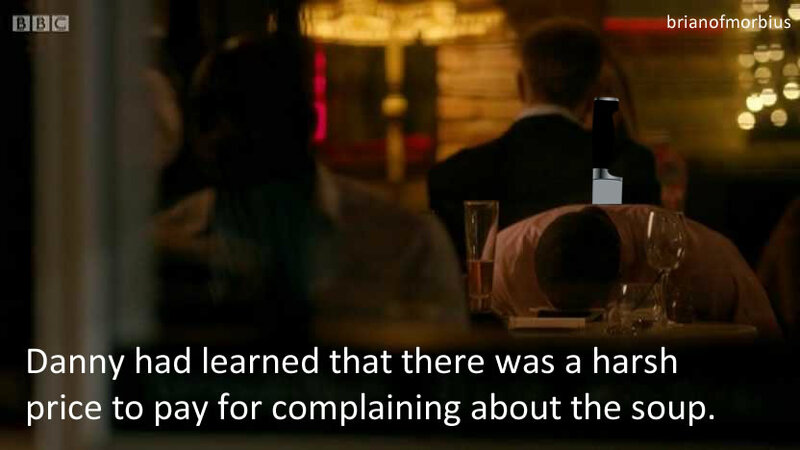 Writing a control freak doesn’t give you license to control all of time and space, and Moffat must surely know this. Spinning out the impossible girl thing over a single arc was irritating enough, but its inclusion here is frankly deplorable. Sentiment abounds. Clearly the intention here is that we leave the room older and wiser and more fulfilled. And oh, look: they’ve dropped in a nod to ‘Day of the Doctor’ while they’re at it, as an audience reminder that Moffat’s revisionism extends beyond the people who get to come along for the ride. 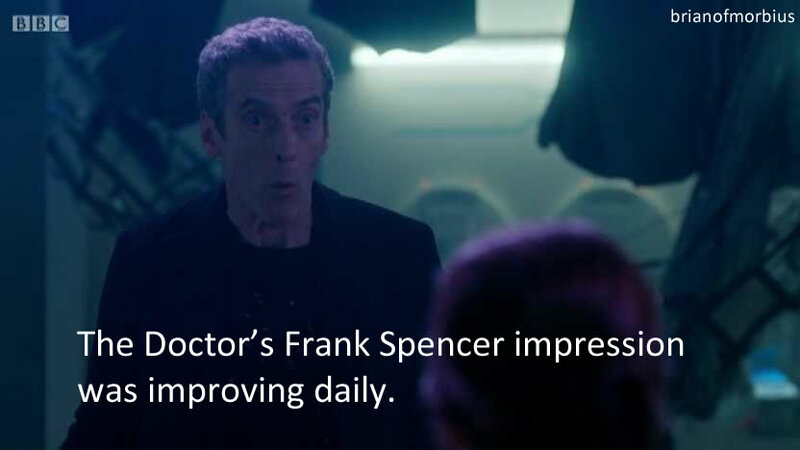 I wouldn’t mind if all these little companion-based tweaks and bumps actually added anything to the Doctor’s character, but they don’t. 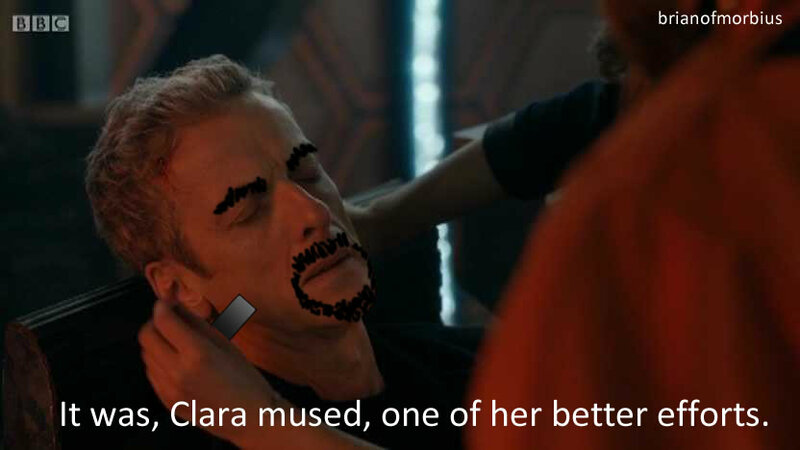 It’s egotism in action, and while it’s supposed to be clever and enlightening and have us evaluate the Doctor in a whole new way, it just feels like the Minecraft skin effect: cosmetic changes that are fundamentally pointless because ultimately they don’t make us think of the person we’re watching any differently. It’s a change that Moffat’s made simply because he can, and while I daresay the tumblr feeds will be buzzing this morning, all I’m reminded of is that scene in Friends where Rachel complains to an increasingly possessive Ross “It was like you were marking your territory. You might just as well have come in and peed all around my desk!”. It’s a shame, because there are elements of ‘Listen’ that were actually very good indeed. 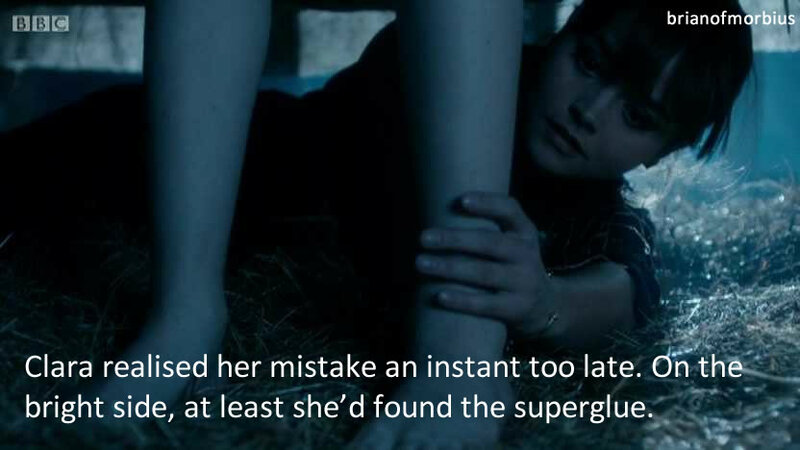 The episode opens with another disastrous encounter between Danny and Clara, this one from Clara’s perspective, as we are shown in flashback the reason she’s come home early, and alone. Then the Doctor arrives, and we’re off to an orphanage, where a young boy is frightened of the Thing on top of the bed. The Thing is under a pile of covers. 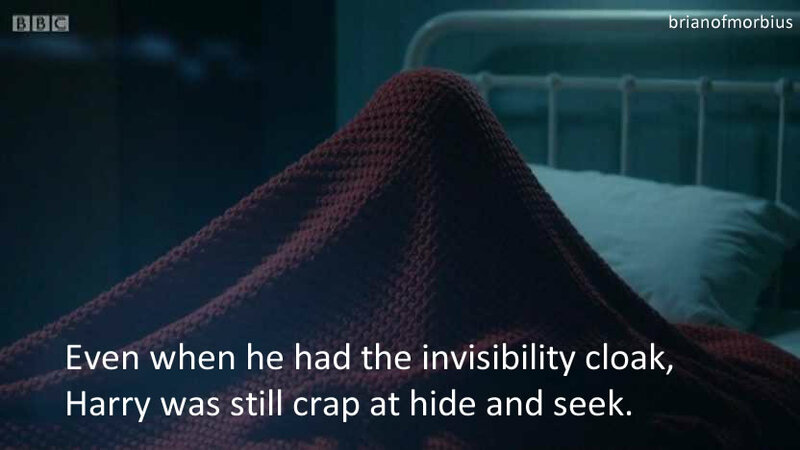 We never see it, although the Doctor does. He reassures the young Rupert Pink that “Fear is your superpower”, even though he’s apparently as frightened as anyone else. The camera cuts back and forth with vigour, allowing us glimpses of the Thing but teasing us all the while. It is an electrifying scene, superbly directed with impeccable performances from everyone, including the heap on the bed. Similarly, the planet at the end of the universe is impressive, even if this is where the story starts to tail. It isn’t enough that this nameless lump of rock is just a colossal McGuffin. There is something outside that door, and the fact that we never get to see it wouldn’t be so frustrating if it weren’t established that it wasn’t actually important. Because rather than actually discuss what happened when the airlock blew, Clara and Orson watch the Doctor have a catnap and then she launches the TARDIS. And they didn’t even visit the restaurant. Ultimately, it emerges, we’re watching a story about Clara: her relationships past and present and the hold she has over the Doctor, and over Danny. This is partly what makes the episode so unsatisfying, because it starts out as something else completely, with strong performances from everyone, particularly the Doctor. If, in ‘Robot of Sherwood’, Capaldi was basically forced to be Shrek on his way to lunch at The Ivy, in ‘Listen’ he takes centre stage – at least until the locks on the ship blow. He’s controlled and cynical but also calm and reassuring, and it’s therefore frustrating to see him sidelined during the last fifteen minutes in favour of Moffat’s emotional fanwank. 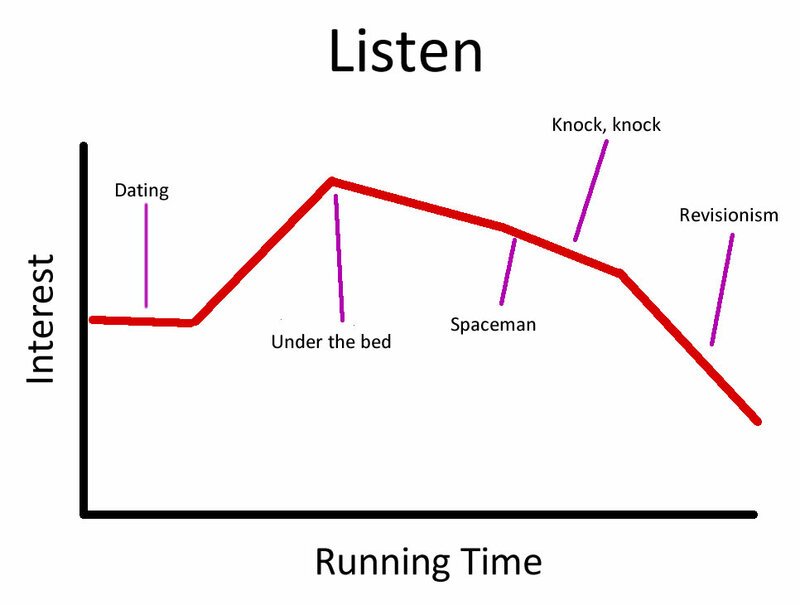 And ultimately, it’s the uneven structure of ‘Listen’ that proves its undoing. If the point, as Clara muses at the end of the final act, is that there really is nothing under the bed – presumably so that the BBC have a standard press quote for when the OFCOM letters start to arrive – then why establish this in such a confusing manner? It’s suggested that the pile of blankets on Rupert’s bed was another orphanage resident having a joke, but it’s a point that is ultimately lost amidst all the time-hopping and revisionism. The other week, I described ‘Into the Dalek’ as an episode that did nothing particularly well and nothing particularly badly. ‘Listen’ was up and down like a rollercoaster, its highs more than eclipsed by its lows. Like Clara and Danny’s first date, it was a good idea, ultimately squandered by stubbornness and ego. In the end, there is nothing beneath the bed but old territory revisited, and you can’t help thinking there are better ways to spend an hour of your life.